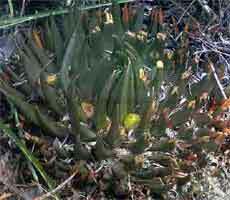 Ariocarpus trigonus elongatus LRM107, near San Antonio, November 1999. Ariocarpus trigonus elongatus LRM107 a very old specimen, elevated 10cm above the surrounding ground by erosion. 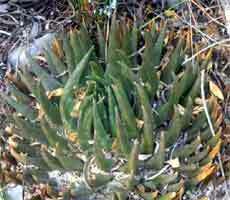 Plants of Ariocarpus trigonus at San Antonio are of the longer thinner tubercled type often referred to as A. trigonus var. elongatus. The population illustrated here was small in number, and suffering from the activities of grazing cattle and goats, whilst the plants do not appear to be eaten by cattle, goats do occasionally graze the tubercles. Many plants were damaged by kicking, and the trampling of hooves was causing severe soil erosion. 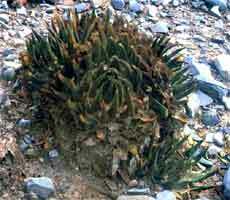 The large old plant shown here was situated on a mound at least 10cm higher than the surrounding area due to erosion.